OBLIVION starring Tom Cruise and Morgan Freeman. Shot on F65 and EPIC. Thread: OBLIVION starring Tom Cruise and Morgan Freeman. Shot on F65 and EPIC. #1 OBLIVION starring Tom Cruise and Morgan Freeman. Shot on F65 and EPIC. 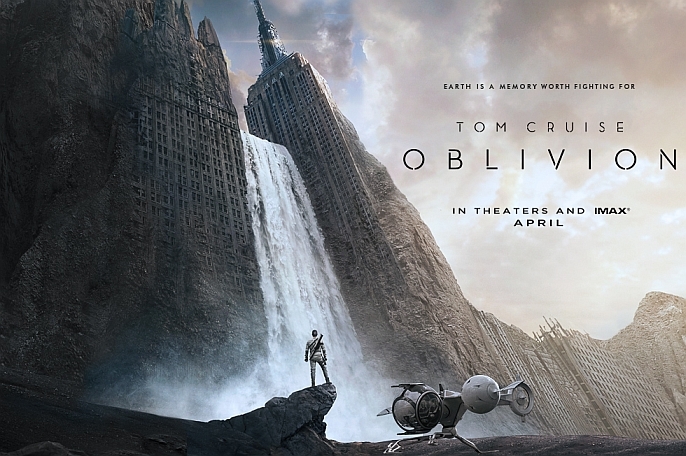 Futuristic / post-apocalypse sci-fi action "Oblivion". Directed by Joseph Kosinski ("Tron Legacy"). Shot on Sony F65 (Raw 4K) and Red Epic (Raw 5K). Also just found blog on Keslow Camera site with very related pics and a slideshow. You can see F65 and EPIC in full armor. Saw this earlier today and it looks very cool. I actually like Tom Cruise in this film. Looks great. My Real Name is Matt Ryan Hayslett. Excellent!! Some good hard SF!! This and Elysium in 2013 will be amazing. Tom Cruise and Morgan Freeman are excellent in this film, It's going to be great! Now Don't you forget Claudio Miranda - Cinematographer!!!. Sony F65 was used for 90% of the film, Epic was used for Steadicam, handheld, mini-heleicopter, and vehicle mount shots. We had to depend on Sony and their updates, but they listened to us and gave us new features almost every month. As soon as there was any problem, Sony was on Set the next day to solve any mystery that came up. Otherwise, The entire crew of this project was absolutely amazing...!!! Keslow Camera worked around the clock to finish the modifications to the Sony, They even improved the camera as we were shooting!! They deserve a lot of credit here, Micheal Kramer and Andre Wright! They have given us unprecedented support for the Red Epic an SonyF65. All I can say is 'We were well prepared after leaving LA'. Thanks Alex... As always it's a pleasure to work with you guy's!!!!! I watched the preview at the cinema the other day and went wow.... someone did a great job with the epic, suffering zero of the hazy anemic face tones i'm used to on a lot of movies shot on red. The drama shots in this film look incredible, his face is so rich and beautiful.